We painted all of the trim white and painted the walls. You can't tell but the color is a much softer and calming shade called Tattered Sail by Olympic. We brought in new shades and curtains and that's pretty much it - woooo. These sofas are pretty comfy but boy I don't like them. But with a two year old and lots of teenagers over all of the time, I'm really not ready to invest into something new until these have just had it. I guess at least they are not neon purple or something. So here we are now with a few little additions. I'm finally playing around with putting things on the wall - it only took me two years. I have several art and photo things I'm working on so I'll be sharing those soon. For now, here's a glimpse of one of the items I have up so far.. I changed out the old lamp shade with a new one from Target - I love how that seemed to immediately brighten that spot up and it also gives off more light at night. My sweet husband gave me a West Elm gift card for Christmas so I have been picking up a few things here and there like this little birdie, coasters, blue throw and ikat bowl. I have been looking for pillows - forever. My issue with pillows is usually the price. I just can't get over paying $30 or more for a throw pillow, I just can't do it. Target put a bunch on clearance last week and I snagged a few - this little geometric guy was only $7.58 - I was sold. The white ones are Nate Berkus for Target and they were $12. I was so excited to get such great prices on cute pillows. One thing about our living room that I need to start tackling is our cord issue - we have many as you can see above. This is not jiving with my new "get organized" kick so I need to get on this. I'll be honest though, I'm kind of dreading this project. When I figure this mess out I will definitely let you know. So just a few little pops of color brought a lot more warmth and coziness to this space. I'm liking it so far! I have more plans for wall photos and artwork and some cord nightmares to face so this little room is definitely a work in progress. 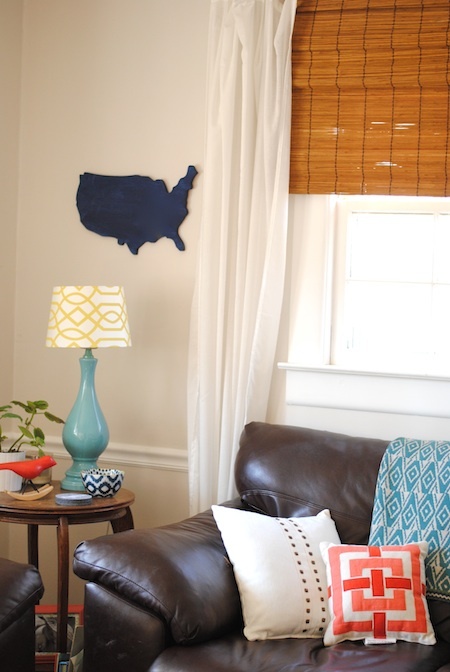 So how about you guys...have any plain rooms that need some pops of color? 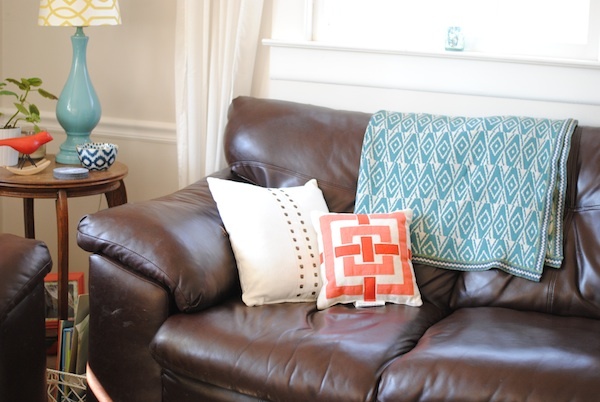 Do you have sofas that you loathe but are stuck with or cord madness that you dread tackling? 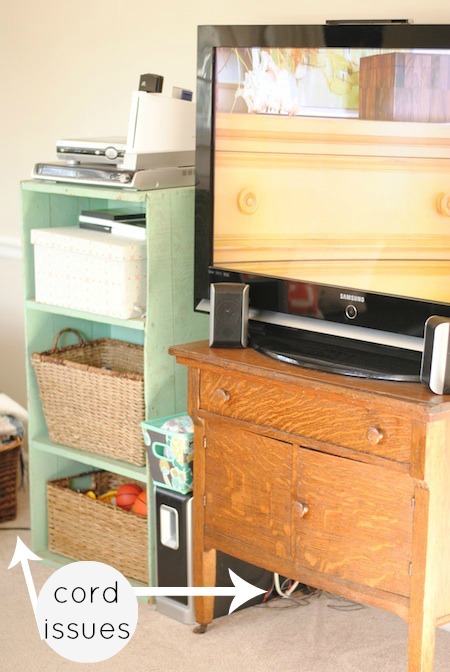 Share with me your living room woes! Hope you have a wonderful weekend and stay safe and warm! PS - don't forget about the Pinterest Challenge going on now! Link back up next Wednesday, Feb 27th! It looks great! I hate cords. Seriously. We have our TV mounted now but we still need to hide the mess of cords. They are just so unattractive. I just picked up that yellow lamp shade from Target for our office. Isn't it fabulous? I really love all the updates and blinds. We have those same ones on the french doors in our Living room. Still can't decide on curtains though. Have a great weekend! Cords are the worst!! You just can't make them pretty no matter what, haha! I looove this yellow shade - it has made everything so much brighter! Thanks for stopping by today Laurie! Hope you have a great weekend as well! I just found your blog through the Pinterest challenge and I'm glad I did. I'm loving it! I snagged a few of those Target pillows myself last week. I couldn't believe I stumbled upon such cute, fairly inexpensive pillows. I'm looking forward to reading more! Aw, thanks so much! Seriously, I was so excited to find some cute pillows at a great price!! Target always pulls through :). Wow, thanks so much Bre! This is probably the room I struggle the most with - mainly because these sofas are just huge and clunky but I'm trying!! Thanks for stopping by! Looking good! I hear you on sofas....I've been regarding ours as more or less disposable until the kids move out ;). I'm hoping to save up for a new one in the next few months and give keeping a niceish one in good shape a try, though...we'll see! I know right! I just can't break down and invest in a nice sofa right now! I have to deal with the ugly clunkers for a while longer, haha! 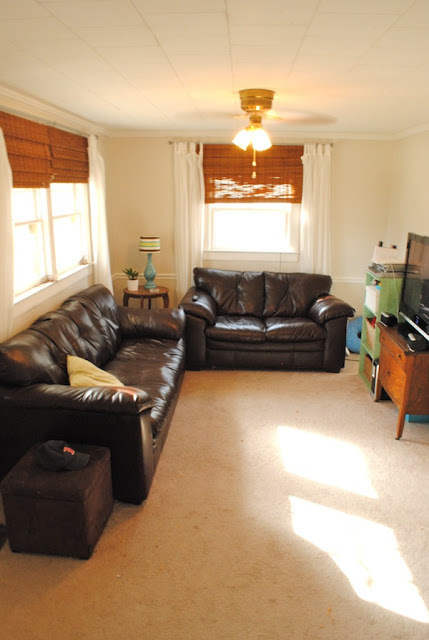 I really want a more modern gray toned sofa - maybe even a sleek sectional? One day.....one day. I know! I've had it for a long while and have finally put it up! Its a Target find - but its actually a cutting board - I just painted it :). Thanks Melissa! Your makeover looks great. I love the different colors and textures. Loving the pops of color and the geometric patterns! You have an eye for accessories, Miss Megan! Happy weekend! haha, thanks Abby!! Hope you have a great weekend as well!! I'm anxiously waiting your solution for cords. My husband is an electronic junkie. I thought I was winning the battle when they started coming out with "cordless" items, but it doesn't seem to have helped a whole lot. I hope you start working on this soon; I'm going out of my mind! Decorating doesn't come easily to me, so I rely on people like you to keep me focused. Your rooms look beautiful. Thanks Doreen! My husband loves electronics too! We have cords galore so I am definitely needing to find a better solution! Hopefully I will have something to share soon :). Thanks so much for stopping by!! You go girl! I love the cut-out of the United States! 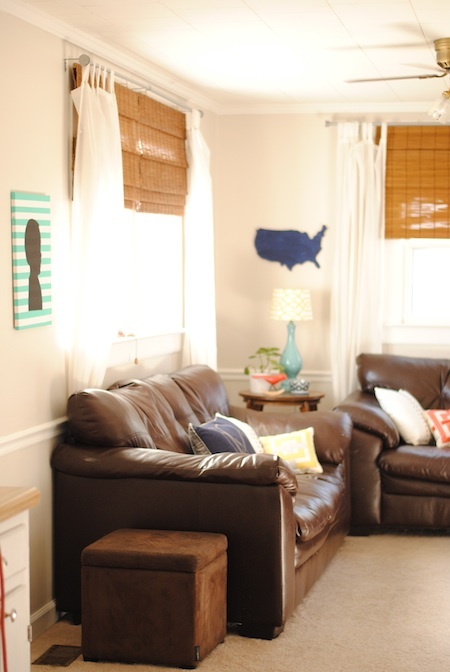 Love your pops of color to spice up the brown couches! 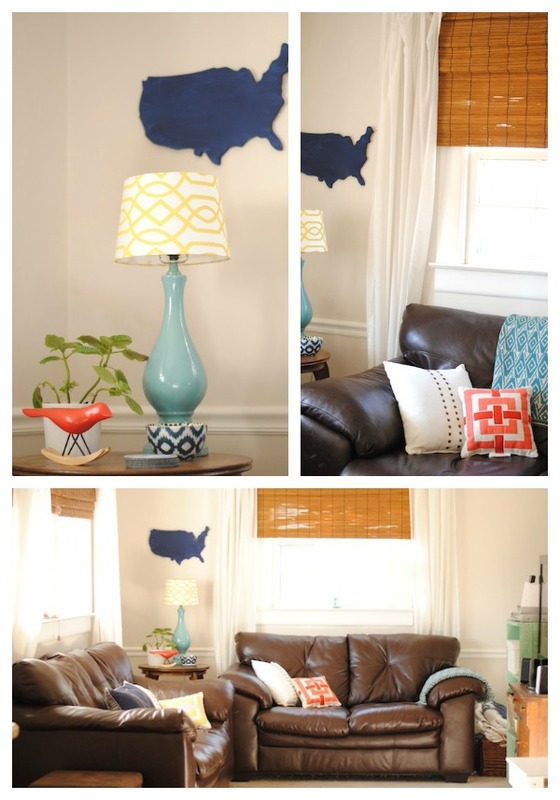 I really want to add some fun pops in the form of pillows and art to our living room too! I too really want to see what you do with the cords! I love this space so much more now that I brought in some color to help take away from all of that brown!! I have some ideas about the cords, time to start trying some things out! I'll share soon! It looks like it's getting there. I love that little birdie from West Elm - too cute! Thanks Christa! West Elm always has the cutest birdie decor - love it.